My favorite season is almost here!!! 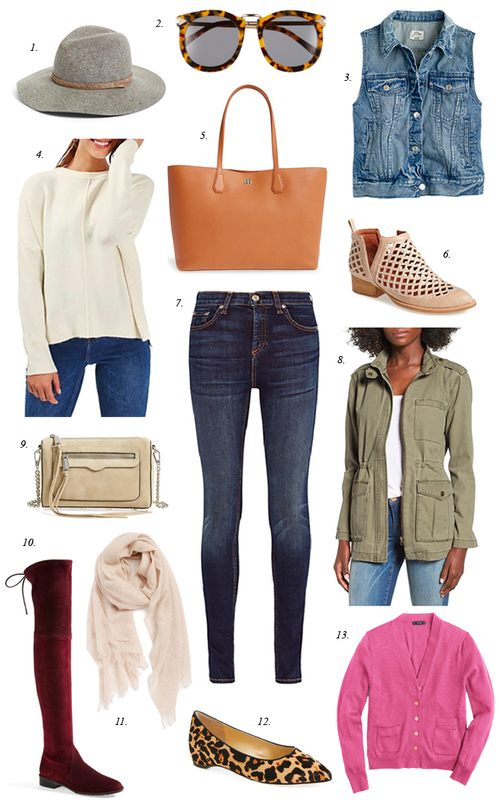 Above are some of my fall must-haves that you’ll wear all season long! I love this roundup! The pieces are so gorgeous & perfect for transitional dressing – plus those gorgeous boots are stunning! I know fall is around the corner but it doesn’t seem that way. I don’t want to think about fall yet. the burgundy red over-the-knee boots look so beautiful and they are definitely my absolute favorite fall pieces. I love the cheetah shoes and jean vest! Great picks! 1, 4 and 13 are my go-to looks for sure. Loving your picks, Rach, especially those shoes, both are perfect for the season! Love the glasses and those boots! Super cute. My favorite season is Spring/Summer. So, I am not mentally ready for Fall yet, but seeing these cute pieces especially the hat and those over the knee boots, gives me a little hope that I might welcome Fall with open arms. I’m loving the animal print flats. I’m a summer girl at heart but I’m excited for bonfires and pumpkin everything. Absolutely love! Leopard flats are always a fall staple – leopard is a neutral, after all ;) Everything you included has me craving cooler temps and feeling inspired, as always! I have the Jeffrey Campbell boots and I love them!! love everything on here!! especially those otk boots– i am so happy those are still in style, they are my fav!!! The hat is perfect ! I love your selections <3 My favorites would have to be the hat, sunnies, tote, scarf, sweaters and of course booties. So pretty much I love everything. I hope you are doing well. You look absolutely gorgeous on the photos you took in the middle of the woods.